Aplus Total DVD Ripper is an all-in-one DVD Ripper program which helps to rip your DVD movies to avi, divx, xvid, mpeg, wmv, wmv8, wmv9, rm, rmvb, mp4, 3GP, 3GP2, flv format video and mp3, ac3, aac, wma, wav, m4a audio files. 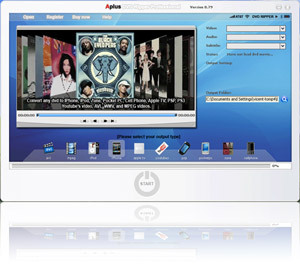 With Aplus Total DVD Ripper, you will be able to rip and enjoy your DVDs movies on Apple iPod, iPhone, Apple TV, Sony PSP, PS3, BlackBerry, Microsoft Zune, Windows Mobile Pocket PC, Archos Media Player, Creative Zen Visoin. ...... Cell/ mobile Phone, Windows CE handheld device and any portable media player. 1). New Version With xvid / h.264 encoder ensure compress with high speed and no loss movie quality. 2). with latest industry standard compression technology no loss of quality of image and sound quality. 3). With the newest dvd ripper technology support all dvd movie discs with all kinds of DVD movies. 1. Various settings provide the flexibility and effectiveness of output. 2. Choose subtitles and Audio tracks to rip. 3. Output file size is adjustable. You can compress movies to any size you need. 4. Supports preview. You can see the ripping progress in a preview window. 5. Choose different DVD types: both NTSC and PAL are supported. 6. Rip DVD movies to avi, divx, xvid, 10% size, same quality. 7. Rip DVD movies to MPEG1/VCD PAL/NTSC, MPEG2/SVCD PAL/NTSC. Qweas is providing links to Aplus Total DVD Ripper 1.0.0 as a courtesy, and makes no representations regarding Aplus Total DVD Ripper or any other applications or any information related thereto. Any questions, complaints or claims regarding this application Aplus Total DVD Ripper 1.0.0 must be directed to the appropriate software vendor. You may click the publisher link of Aplus Total DVD Ripper on the top of this page to get more details about the vendor.